I decided, per usual, not to make any New Year’s resolutions. Rather, James and I created a bucket list for 2015 – with achievable goals that included traveling, saving money (those seem to oppose each other, don’t they?) and updating this blog more often (for James, writing more songs). And now it’s already 25 days into the month and I have yet to post anything! I would like to blame that on making big batches of previously created recipes (including my pumpkin pork stew, pasta sauce and chili). That’s part of the problem, but also eating out and not recording any recipe creation is really the culprit. Like the gluten free buckwheat biscuits eggs benedict with vegan hollandaise sauce. Why didn’t I record as I went? Why didn’t I take any decent photographs? Who knows. Probably hunger. 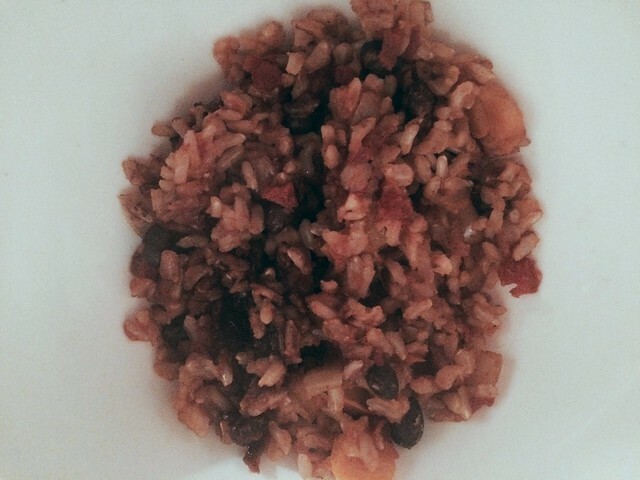 Anyway – I thought I would finally take the opportunity to present one of my easier, rice cooker dishes – as the recipe I came up with recently was superb, and this is something I do dearly miss since going back on the GF wagon (now three years ago!). In a large frying pan, heat the olive oil on high. Add in your chopped peppers and onions, reduce heat to medium, and let cook for 4 – 5 minutes, stirring occasionally. Remove from heat.In the rice cooker, combine the rice, water, tomatoes, cooked peppers and onions and chili pepper. Mix to combine, then cover. Cook using rice cooker directions (I simply pushed the brown rice button and walked away). Once done, fluff with a fork. Add a can of black beans (optional) and serve on top of baby kale (also optional) and if you’re feeling fancy, top with shredded cheddar.